This is an exciting time for our society as we are in the final stages of preparation for our upcoming Congress. The 12th Congress of IXA will be held jointly with the iABO/Hyper Immune Symposium in Osaka, Japan, from Nov 10-13, 2013. The program has been designed to promote a truly interdisciplinary exchange of scientific progress and concepts among investigators active in these different, but increasingly related and overlapping fields. We invite you to explore the program of the meeting by visiting www.ixa2013.org. Also don’t forget to renew your membership or become an IXA member to be eligible for reduced congress registration fees, travel awards and many other membership benefits! Visit www.tts.org/ixa to apply for or renew your membership today. We are very pleased to report the 2012 Impact Factor for Xenotransplantation, the Official Journal of the Society, is 2.6. This reflects an increase over previous years, and ranks Xenotransplantation among the top 50% of journals in transplantation. Lastly, we would like to remind you about the new Carl-Gustav Groth Xeno-Prize, a joint initiative of IXA and Xenotransplantation’s publisher Wiley. The winner of the 2012 Carl-Gustav Groth Xeno-Prize was announced recently and you can view the winning abstract here. We would like to congratulate Dr. Christopher Burlak of Indiana University. 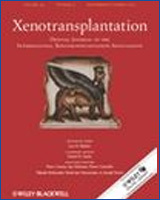 Submit your manuscript to Xenotransplantation for a chance to win the 2013 Xeno-Prize!